Nervous system function is determined by the activity of neuronal networks and neuron ensembles, whose characteristic features are shaped by the properties of their component neurons, the interactions between these neurons, as well as influences by other, external neuronal ensembles. A current challenge and, concomitantly, a large promise for a deeper understanding of network function, are to elucidate how cellular and subcellular components and processes define and shape network function. 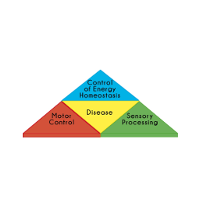 This basic theme in the neurosciences will be approached for the neural networks underlying sensory processing, motor control and control of energy homeostasis. Neurological diseases affecting these three key components of our nervous system constitute a fourth theme organically connected to all three areas as dysfunction allows intimate insights into the respective areas. The Research Training Group (RTG) is designed to advance our understanding of network function at the cellular and subcellular level by making use of the particular strengths of UoC research groups. This approach will provide a challenging and stimulating research environment for the graduate students of the RTG.